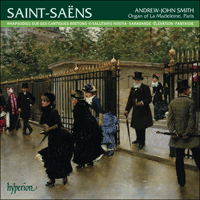 This third volume completes Andrew-John Smith’s series of Saint-Saëns’ Organ Music, which has been praised for the compelling brilliance of the performances, the inspired choice of instrument and the remarkable quality of the music itself. The recital ends with the formidable Fantaisie pour orgue-Aeolian, a work which makes extraordinary technical demands on the organist—in fact the composer himself wrote that it was ‘unplayable by the fingers and feet’. This led to the work being condemned to obscurity and it was as recently as 1988 that it was reconstructed and published for the first time. Andrew-John Smith’s performance defies this edict, and the translation of the original registration to the organ of La Madeleine is a feat of ingenuity. Described by Reynaldo Hahn as ‘musical art’s last great classicist’, so much has been made of this aspect of both his work and his personality that even in his own lifetime Saint-Saëns came to be seen as old fashioned and reactionary. Whilst in some ways this is justifiable, the enormous commitment with which he embraced innovation is just as significant. He was one of the first mainstream composers to write solo music for the harmonium, and amongst the first French composers of the nineteenth century to write chamber music. In February 1871 he became a founding member of the Société nationale for the promotion of French music and was credited with almost single-handedly developing the solo concerto in France. He was one of the first to incorporate genuine Arabic melodies into his scores, such as those in Samson et Dalilah, or the Suite algérienne, Op 60, and in 1908 became the first notable composer to write a film score with L’assassinat du Duc de Guise, Op 128. He was fascinated by the possibilities of electricity and whereas Handel, C P E Bach, Haydn, Mozart and Beethoven had written for early types of musical automata, in 1906 he became the first composer of note to write exclusively for the fully automated self-playing pipe organ. The Aeolian Hall organ was eminently expressive, all stops except the Open Diapason of Manual I being enclosed. The ten-stop Echo division was installed in its own chamber in an adjoining room at the back of the hall. It contained a second Vox Humana … The chimes on the Aeolian organ were tubular bells, exactly like orchestral bells struck by electrically actioned hammers. Their compass was 20 notes: from A below middle C to E, one and a half octaves above; they sounded an octave higher than the notes played on the keyboard … The Aeolian organ was essentially no different from other instruments of its period either in specification, placement, or mechanical accessories. It did, however, have the advantage of additional control through an automatic player mechanism. This organ for which Saint-Saëns wrote did no more than reproduce the notes as punched on a paper roll … The rolls were perforated by hand by factory workers, euphemistically identified on the labels as The Aeolian Organ guild. All directions for interpretation were printed on the roll with rubber stamps … the swell pedals and the crescendo pedal were operated by the ‘organist’ … The tempo, accelerandi and ritardandi were controlled by the tempo lever. This instrument is of particular significance in the composition of Saint-Saëns’ Fantaisie pour orgue-Aeolian as it seems highly probable that the composer visited and familiarized himself with it when in London for the premiere of his second Cello Sonata, Op 123, at Bechstein Hall on 12 July 1906. At this time he had already received the commission from the Aeolian Company in New York to compose an original work for their automated instruments and it is hard therefore to imagine a man with such capacious curiosity not taking advantage of this happenstance. Although some nineteen transcriptions of Saint-Saëns’ works are to be found in an Orchestrelle catalogue of 1901 they were not made by him and it is unlikely that the composer ever saw one of these instruments. The first draft of the Fantaisie, entitled ‘Morceau écrit pour l’orgue Aeolian’, was almost certainly composed in London, written as it is on manuscript paper manufactured by the London firm of Beale and Chappelle. When he visited New York as part of an American tour in October 1906 Saint-Saëns delivered the finished manuscript in person to Frank Taft, Director of the Aeolian Company, who issued it the following year. Both the Aeolian Company and Saint-Saëns himself made much of the piece’s prodigious technical demands. In a programme note for their catalogue the Aeolian Company wrote: ‘The Fantaisie was composed especially for the Aeolian pipe organ and in it Saint-Saëns has availed himself of the privileges afforded by the technical facilities of the instrument … [he] has disregarded the limitations of the human performer and has embraced the opportunities of the enormous technique of the Aeolian pipe organ.’ Saint-Saëns confirmed this opinion when he described the work to his secretary and biographer, Jean Bonnerot, as ‘unplayable by the fingers and feet’. This belief, together with the lack of a conventionally notated edition, has condemned the work to obscurity and it was as recently as 1988 that Rollin Smith, working from the first draft and the perforated rolls, reconstructed the work and published it for the first time. Though written in clearly defined sections, the work flows in a constant stream of invention in which a tripartite introduction is followed by a theme and four variations. The last of these gives way to a more placid central section in F sharp major which introduces a second theme followed by a variation in which the rapid right-hand passagework is designated for the harp. As the Aeolian Hall organ didn’t receive its harp until 1909 it is probable that Saint-Saëns hadn’t heard one by the time of the Fantaisie’s composition, though he was presumably aware that it involved the striking of tuned metal bars. This variation is followed by the introduction of a third theme which is developed, together with the second, towards the finale where the first theme returns in conjunction with the third. Saint-Saëns saved the chimes for this point where Smith has rather splendidly described their use as ‘great clanging orchestral bells pealing in dialogue with the full organ’. On this recording the registration markings of the Aeolian Company rolls have been freely translated to the organ of La Madeleine where ways have been found, with very few exceptions, to play all of the notes written by the composer. The chimes are here performed on a set of orchestral bells. When Saint-Saëns took over the piano class at the École Niedermeyer in 1861 he was no less innovative in the teaching of Wagner, Schumann and Liszt to the pupils he inherited there. Among their number were Eugène Gigout, Albert Périlhou and, most notably, Gabriel Fauré. Whilst he was to enjoy lifelong friendship with each of them, it was Fauré with whom he formed a particularly special bond. Although only ten years stood between them the relationship was both filial and that of teacher/pupil. Just as Saint-Saëns was never quite able or willing to relinquish his position of authority, Fauré seems, on the whole, to have accepted it with gratitude. Saint-Saëns did much behind the scenes to secure positions for his protégé and it was not by chance that Fauré later succeeded him as organist of La Madeleine. Following the tragic deaths of his own sons in 1878 Saint-Saëns treated Fauré’s boys, Emmanuel and Philippe, as nephews and Marie Fauré accepted the older man as a member of her family. The Trois Rhapsodies sur des cantiques bretons (Pèlerinage au Pardon de Sainte- Anne-La-Palud), Op 7, to give the work its full title, were written at Douarnenez in August 1866 and are dedicated to Fauré. Earlier that year Fauré had taken up his first position as organist of St Sauveur in the Breton town of Rennes and was not enjoying life. Saint-Saëns and his friends Henri Regnault, Georges Clarin, Emmanuel Jadin and Ulysse Butin visited the area and were joined by Fauré on a pilgrimage to Sainte-Anne-La-Palud. It was during a boat trip that the ‘thin rustic sound’ of the captain playing local folk tunes on an oboe suggested the Rhapsodies to their composer. The theme of the first Rhapsodie has been identified as a ‘Cantique des missionaires’ and the secondary theme of the second as a Breton Noël. In post-Revolution organ repertoire only the fugue retained its status as art music and just as the Te Deum became a vehicle for hunting and battle pieces the Noël was appropriated for patriotic songs. The tradition of organ Noëls in France can, however, be traced back to the seventeenth century, arguably reaching its zenith in the works of Daquin. It is this pre-Revolutionary tradition that Saint-Saëns reflects in his Op 7, and whilst the thematic material for the third of the set has not been identified, both the first theme in A minor and the musette in F major owe something to Daquin. Saint-Saëns was evidently pleased with the work and he was quick to transcribe it in versions for piano four hands and harmonium. Having performed the work himself on numerous occasions he returned to it in 1891 when he orchestrated the outer movements under the new title of Rapsodie bretonne (Op 7 bis). It is probable that having lived with the work Saint-Saëns felt that these movements belonged together. Aesthetically they share much in common and despite the two sections of the orchestral score it is clearly conceived as one work. It is possible that the composer considered the second movement of Op 7 less suitable for orchestration, although given the size of the orchestra he deployed this seems unlikely. Less likely still is that he didn’t think the piece worthy of further attention; it is a fabulous work, quite disarming in its musical honesty. Although published together under a single opus number, the collection does not form a unified musical entity, and the ordering of the pieces on this recording reflects the composer’s thinking in 1891. The Élévation ou Communion in E major, Op 13, was dedicated to another of Saint-Saëns’ friends, Alexis Chauvet, whom the composer helped secure his old position at St Merry in 1863. Whilst it survives in an early manuscript that may date from as early as 1856 (Bonnerot gives 1859) it was not published until its inclusion in a volume by Canaux et Maeyens-Couvreur in 1865. There remains the possibility that it originated as a now-lost motet for upper voices though by the time of its publication it was on two staves and carried the indication ‘2 Claviers et Pédale’. The work clearly enjoyed a certain success and was republished by Durand in separate versions for organ and harmonium in 1880 and in Saint-Saens’ own transcription for piano solo in 1886. Whilst the charming Sarabande is best known as the second movement of the 1863 orchestral Suite, Op 49, an early untitled version for organ or harmonium survives in a manuscript from 1859. It was nonetheless first published in 1877, both in its full version and a four-hand piano arrangement by Guiraud. In 1890 Durand published it in an organ ‘arrangement’ on three staves by Saint-Saëns’ friend Gaston Choisnel, almost certainly made under the composer’s supervision. It later appeared in Échos du monde religieux (1901) and L’Organiste (1911), once again on two staves, under the title Offertoire. Gaston Choisnel appears again as the dedicatee of O salutaris hostia, the only organ transcription of his own work that Saint-Saëns ever published. Generally he was happy to allow others (Guilmant, Busser, Boëllmann and Gigout among them) to undertake these arrangements for him, but in 1904 he himself returned to the Mass, Op 4, of 1856, and to its graceful fifth movement, for sopranos and organ, as the source for this miniature. He performed the piece himself at the Salle Pleyel in November 1904, prompting Arthur Pougin to write in Le Ménestrel of this ‘absolutely delightful’ work that it ‘so enchanted the audience’ and that ‘so enthusiastic was the applause that he should have repeated it’. De Saint-Saëns, Reynaldo Hahn dit qu’il était le «dernier grand classiciste de l’art musical», et cet aspect de son œuvre et de sa personnalité fut tellement exagéré que, de son vivant même, il passa pour démodé et réactionnaire. Ce qui, pour se justifier à certains égards, ne doit pas faire oublier l’immense engagement avec lequel il embrassa l’innovation. Il fut l’un des premiers compositeurs marquants à écrire de la musique solo pour harmonium et l’un des premiers Français du XIXe siècle à rédiger de la musique de chambre. En février 1871, il devint l’un des membres fondateurs de la Société nationale destinée à promouvoir la musique française et on lui reconnaît d’avoir, à lui tout seul ou presque, développé en France le concert avec soliste. Il fut parmi les premiers à incorporer d’authentiques mélodies arabes dans ses partitions (ainsi dans Samson et Dalilah ou la Suite algérienne op. 60) et, en 1908, il fut le premier grand compositeur à écrire une musique de film avec L’assassinat du Duc de Guise op. 128. Fasciné par les possibilités de l’électricité, il fut, en 1906, le premier compositeur éminent à écrire exclusivement pour les grandes orgues mécaniques entièrement automatisées, tout comme Haendel, C. P. E. Bach, Haydn, Mozart et Beethoven avaient écrit en leur temps pour des automates musicaux. L’orgue de l’Aeolian Hall était éminemment expressif, tous les registres, hormis le principal 8' du manuel I, étant enfermés. Les dix registres de l’écho furent installés dans leur propre compartiment, dans une pièce attenante au fond du hall. On y trouvait une seconde voix humaine … Le carillon de l’orgue de l’Aeolian était un jeu de timbres, exactement comme un Glockenspiel frappé par des marteaux actionnés électriquement. Son étendue était de vingt notes: du la en dessous de l’ut central à mi, une octave et demie au-dessus; il sonnait une octave plus haut que les notes jouées au clavier … L’orgue de l’Aeolian ne différait pas foncièrement des autres instruments de l’époque, que ce fût dans la disposition, la localisation ou les accessoires mécaniques. Mais il avait l’avantage d’offrir un contrôle supplémentaire par le biais d’un mécanisme automatique. Cet orgue pour lequel Saint-Saëns écrivit ne faisait rien de plus que reproduire les notes perforées sur un rouleau de papier … Les rouleaux étaient perforés à la main par des ouvriers que les labels appelaient euphémiquement la guilde de The Aeolian Organ. Toutes les indications relatives à l’interprétation étaient imprimées sur le rouleau à l’aide de tampons en caoutchouc … les pédales d’expression et la pédale de crescendo étaient actionnées par l’«organiste» … Le tempo, les accelerandi et les ritardandi étaient contrôlés par le levier de tempo. Cet instrument revêt une importance particulière dans la composition de la Fantaisie pour orgue-Aeolian car ce fut très probablement avec lui que Saint-Saëns se familiarisa lors de son séjour à Londres pour la première exécution de sa Sonate pour violoncelle nº 2 op. 123, au Bechstein Hall, le 12 juillet 1906. À cette époque déjà, l’Aeolian Company lui avait commandé une œuvre originale pour ses instruments automatisés et l’on imagine mal un homme aussi curieux ne pas profiter de l’occasion. Le catalogue d’Orchestrelle (orgue à anches libres construit sur le principe du piano mécanique et destiné à imiter le son d’un orchestre—Ndt) de 1901 compte dix-neuf transcriptions d’œuvres de Saint-Saëns mais ce ne fut pas lui qui les réalisa—selon toute probabilité, il ne vit même jamais un seul de ces instruments. L’ébauche de la Fantaisie, intitulée «Morceau écrit pour l’orgue Aeolian», fut très certainement rédigée à Londres, car le papier du manuscrit provient de la maison londonienne Beale and Chappelle. Lorsqu’il se rendit à New York dans le cadre de sa tournée américaine, en octobre 1906, Saint-Saëns remit en main propre le manuscrit terminé à Frank Taft, le directeur de l’Aeolian Company, qui le publia l’année suivante. L’Aeolian Company et Saint-Saëns insistèrent beaucoup sur les prodigieuses exigences techniques de cette pièce. Dans une note de programme destinée à son catalogue, l’Aeolian Company précisa: «La Fantaisie fut composée spécialement pour les grandes orgues Aeolian et Saint-Saëns a profité des avantages offerts par les facilités techniques de l’instrument … [il] a ignoré les limites de l’interprète humain pour embrasser les possibilités de l’immense technique des grandes orgues Aeolian.» Une opinion que Saint-Saëns confirma en confiant à son secrétaire et biographe Jean Bonnerot que cette œuvre était «injouable aux doigts et aux pieds». Ce qui, joint à l’absence d’édition disposant de la notation conventionnelle, la condamna à l’oubli: ce fut seulement en 1988 que Rollin Smith, partant de l’ébauche et des rouleaux perforés, la reconstitua et en assura la première publication. Écrite en sections bien définies, elle n’en présente pas moins un flot inventif constant qui fait suivre une introduction tripartite d’un thème et de quatre variations, la dernière cédant la place à une section centrale davantage placide, en fa dièse majeur, qui introduit un second thème, suivi d’une variation, où le passage rapide à la main droite est conçu pour la harpe. L’orgue de l’Aeolian Hall ne reçut son registre de harpe qu’en 1909 et Saint-Saëns n’en avait probablement jamais entendu quand il se mit à composer sa Fantaisie, même s’il savait certainement qu’il serait question de frapper des barres métalliques accordées. À cette variation succède l’introduction d’un troisième thème développé, ainsi que le deuxième, aux abords du finale, lequel voit le premier thème revenir conjointement avec le troisième. Saint-Saëns a réservé le carillon pour ce moment où, selon la belle description de Smith, il fait comme «un grand Glockenspiel retentissant, sonnant en dialogue avec le plein-jeu». Pour cet enregistrement, les indications de registration des rouleaux de l’Aeolian Company ont été librement traduites à l’orgue de La Madeleine, où l’on est presque toujours parvenu à jouer toutes les notes écrites par le compositeur. Ici, le carillon est joué sur un jeu de timbres. Lorsque Saint-Saëns reprit la classe de piano à l’École Niedermeyer, en 1861, il se montra tout aussi novateur en enseignant Wagner, Schumann et Liszt à ses élèves, parmi lesquels figurèrent Eugène Gigout, Albert Périlhou et, remarquable entre tous, Gabriel Fauré. Toute sa vie durant, il resta ami avec chacun d’eux, mais le lien qui l’unit à Fauré avait quelque chose de très spécial. Seules dix années les séparaient et pourtant, leur relation tenait ensemble de la filiation et du rapport maître/élève. Jamais Saint-Saëns ne put, ni ne voulut, renoncer à sa position d’autorité, position que Fauré, de son côté, semble avoir globalement acceptée avec gratitude. Saint-Saëns œuvra beaucoup en coulisses pour garantir des postes à son protégé et ce ne fut pas un hasard si Fauré lui succéda à la tribune de La Madeleine. Après la disparition tragique de ses fils, en 1878, il considéra les garçons de Fauré, Emmanuel et Philippe, comme ses neveux, et Marie Fauré l’accepta comme un membre de la famille. Les Trois Rhapsodies sur des cantiques bretons (Pèlerinage au Pardon de Sainte-Anne-La-Palud) op. 7, pour donner leur titre complet, furent écrites à Douarnenez en août 1866 et sont dédiées à Fauré. Plus tôt cette année-là, celui-ci avait pris ses fonctions d’organiste en l’église Saint-Sauveur de Rennes—c’était son premier poste—mais sa vie ne lui plaisait pas. Saint-Saëns et ses amis (Henri Regnault, Georges Clarin, Emmanuel Jadin et Ulysse Butin) vinrent visiter la région et Fauré se joignit à eux pour un pèlerinage à Sainte-Anne-La-Palud. Ce fut lors d’une excursion en bateau que la «grêle sonorité rustique» du capitaine jouant au hautbois des airs du folklore local inspira à Saint-Saëns ses Rhapsodies. Le thème de la première Rhapsodie a été identifié comme étant un «Cantique des missionnaires» et le thème secondaire de la deuxième comme un noël breton. Dans le répertoire organistique postrévolutionnaire, seule la fugue conserva son statut, en tant que musique savante, et, tout comme le Te Deum se prêtait bien à la musique de chasse et à la bataille, le noël convenait aux chants patriotiques. En France, la tradition des noëls organistiques remonte cependant au XVIIe siècle pour culminer, en un sens, dans les œuvres de Daquin. C’est cette tradition prérévolutionnaire que Saint-Saëns reflète dans son op. 7 et, si le matériau thématique de sa troisième Rhapsodie reste à identifier, le premier thème en la mineur et la musette en fa majeur doivent un peu à Daquin. Manifestement satisfait de son œuvre, Saint-Saëns fut prompt à la transcrire pour piano à quatre mains et pour harmonium. Après l’avoir souvent jouée, il y revint en 1891 pour en orchestrer les mouvements extrêmes sous le titre de Rapsodie bretonne (op. 7 bis)—le temps aidant, il avait probablement senti que ces mouvements allaient ensemble. Esthétiquement, ils ont beaucoup en commun et, malgré les deux sections de la partition orchestrale, il s’agit bien là d’une seule et même œuvre. Peut-être Saint-Saëns a-t-il jugé que le deuxième mouvement de l’op. 7 se prêtait moins à l’orchestration mais, vu la taille de l’orchestre déployé, cela semble improbable. Et il est encore plus improbable qu’il n’ait pas trouvé cette œuvre digne d’attention: elle est fabuleuse, d’une sincérité musicale absolument désarmante. Avoir été publiée sous un seul numéro d’opus ne fait pas d’elle une entité musicale unifiée et l’ordre des morceaux reflète ici la pensée du compositeur en 1891. Saint-Saëns dédia son Élévation ou Communion en mi majeur op. 13 à son ami Alexis Chauvet, qu’il aida à préserver son vieux poste à Saint-Merry, en 1863. Cette œuvre ne nous a été conservée que dans un manuscrit ancien, datant peut-être de 1856 (1859, dit Bonnerot), mais elle parut seulement en 1865, dans un volume de Canaux et Maeyens-Couvreur. Il se peut aussi qu’elle ait d’abord été un motet, aujourd’hui perdu, pour voix supérieures, même si elle parut sur deux portées avec l’indication «2 Claviers et Pédale». Elle connut manifestement un certain succès et Durand la fit reparaître dans des versions séparées pour orgue et pour harmonium, en 1880, puis dans la transcription pour piano solo réalisée par Saint-Saëns en 1886. La charmante Sarabande est surtout connue pour être le deuxième mouvement de la Suite orchestrale op. 49 (1863) mais un manuscrit de 1859 en conserve un état plus ancien, sans titre, pour orgue ou harmonium. Elle ne fut toutefois publiée qu’en 1877, dans sa version grande partition et dans un arrangement pour piano à quatre mains réalisé par Guiraud. En 1890, Durand en édita un «arrangement» pour orgue, sur trois portées, effectué par Gaston Choisnel, un ami de Saint-Saëns (qui le supervisa très certainement). Plus tard, elle parut dans les Échos du monde religieux (1901) et dans L’Organiste (1911), de nouveau sur deux portées et sous le titre d’Offertoire. Choisnel fut, en outre, le dédicataire d’O salutaris hostia, que Saint-Saëns—fait unique—transcrivit lui-même pour orgue. D’ordinaire, il était heureux de laisser à d’autres (notamment Guilmant, Busser, Boëllmann et Gigout) le soin de réaliser ces arrangements mais, en 1904, il revint à sa Messe op. 4 de 1856 et à son charmant cinquième mouvement, pour sopranos et orgue, source de cette miniature. Il la joua à la salle Pleyel en novembre 1904, ce qui fit écrire à Arthur Pougin, dans Le Ménestrel: une pièce «absolument ravissante» qui «enchanta tant le public» et qui souleva «des applaudissements si enthousiastes qu’il a dû la bisser». On ne sait pas grand-chose du Dies irae paru pour la première fois en 1991, date à laquelle on lui assigna le titre de «Thème, Variations et Choral», le titre de travail donné ici venant de ce que cette œuvre utilise le plain-chant Dies irae du requiem. Écrite sur sept portées, elle ne nous est parvenue que dans un manuscrit conservé à la Bibliothèque nationale et, chose regrettable, elle s’interrompt à quinze mesures d’un second mouvement. On ignore donc quelle forme, ou même quelle instrumentation, elle aurait prise une fois achevée. Pourtant, la musique don’t nous disposons est trop forte pour être ignorée—son climat, sa thématique et sa texture ne sont pas sans rappeler le premier mouvement de Cyprès et Lauriers, op. 156. Pour Sabina Teller Ratner, elle daterait de 1859, au motif qu’elle figurait parmi des manuscrits de cette époque-là. Si tel est le cas, ces pages sont d’autant plus remarquables qu’elles anticiperaient la musique écrite par Liszt à partir des années 1860. La juxtaposition de styles qu’elle abrite est cependant bien de Saint-Saëns, de la clarté mendelssohnienne de la première variation au paysage aride, dépouillé de la morne conclusion, en passant par l’effervescence romantique de la section centrale. Pareille combinaison ne laisse pas d’être novatrice en soi.